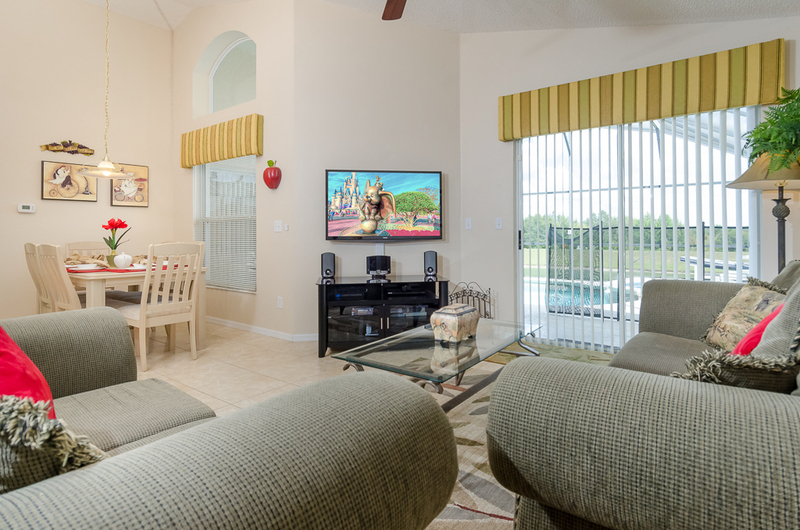 Just bring your suitcase and toothbrush to this newer one story home near all the attractions. 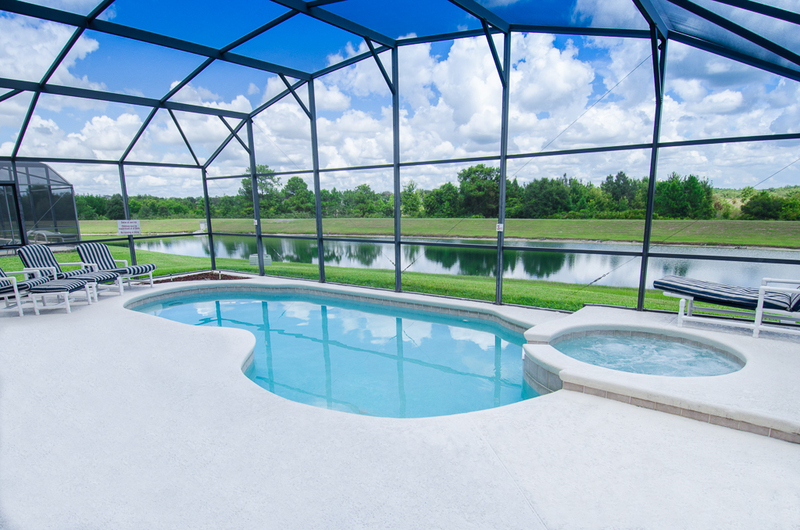 Everything you could possibly need is there in this beautifully furnished four bedroom, three bathroom pool/spa home overlooking a sparkling pond! 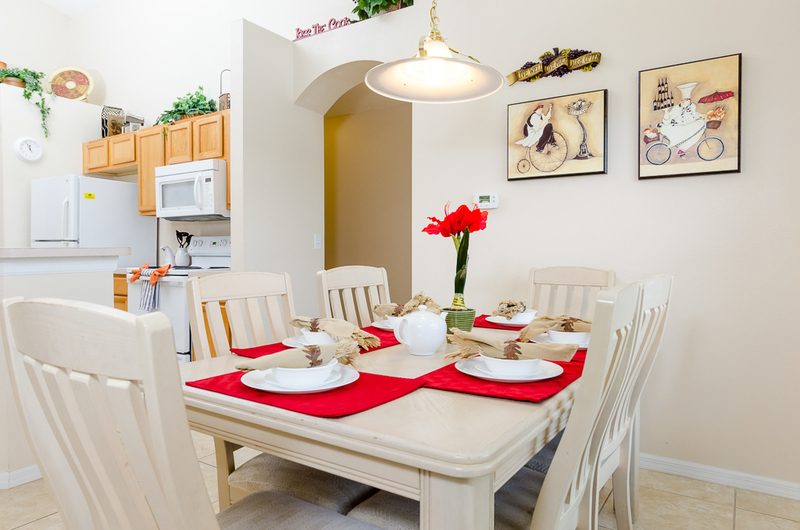 This tastefully decorated home is beautiful both inside and out. Upon entering the home a spacious living room is found with soaring cathedral ceilings. From the living and dining room, take in the wonderful view of the screen enclosed pool, spa, and pond. 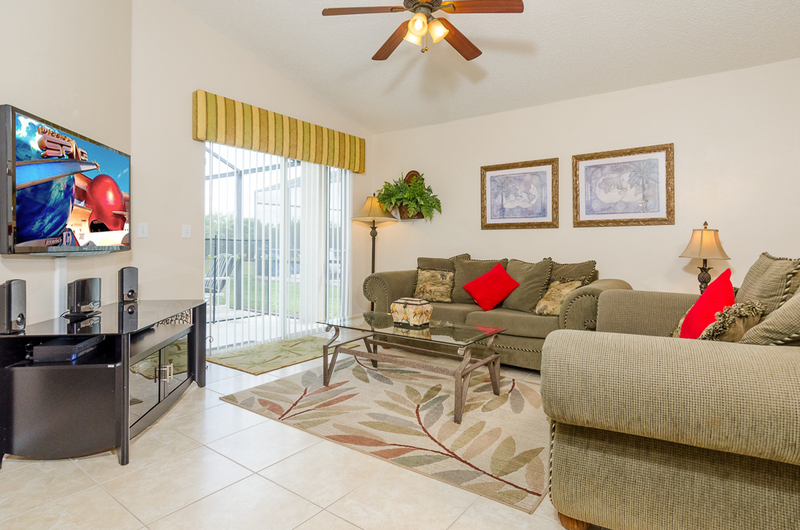 Enjoy sitting on the patio furniture under the covered lanai or on the sunny pool deck. 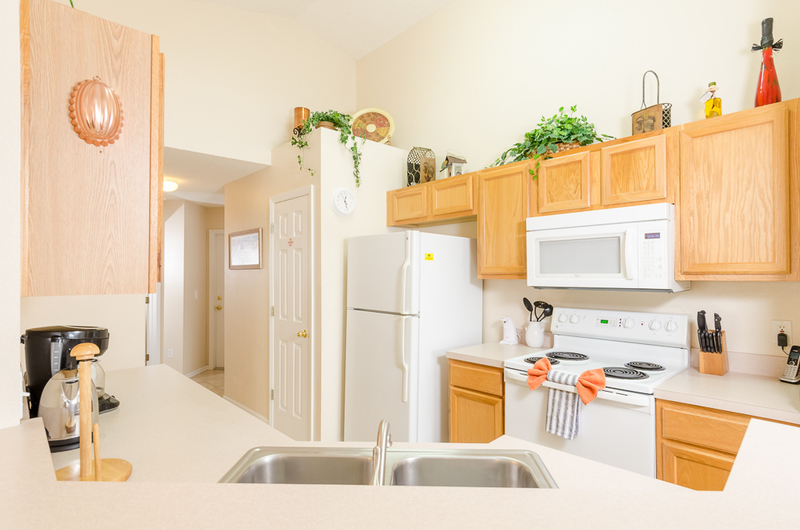 The contemporary kitchen boasts a breakfast bar, closet pantry, and complete set of appliances (microwave, range, dishwasher and refrigerator). 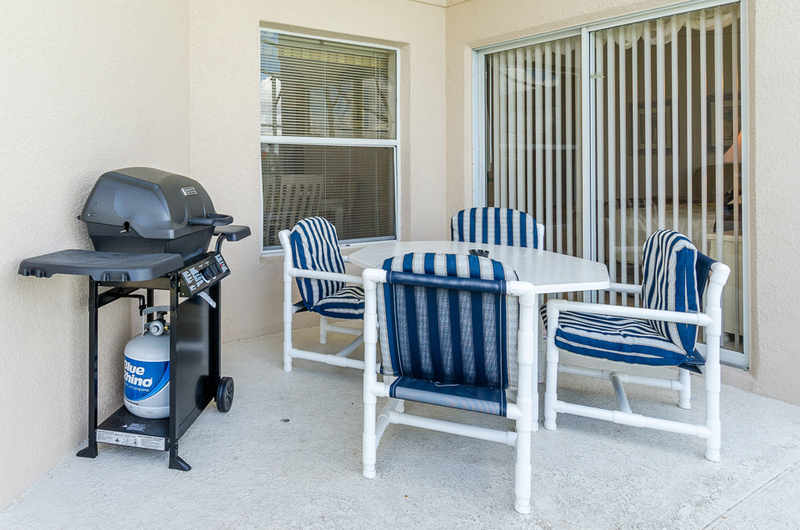 A full size washer and dryer are also included with this vacation home. 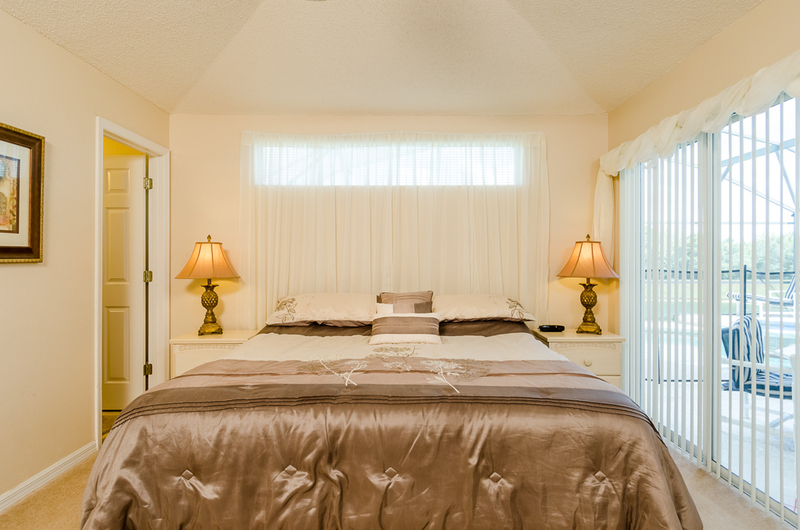 The primary master suite features access to the pool deck through sliding glass doors and from the master bathroom. 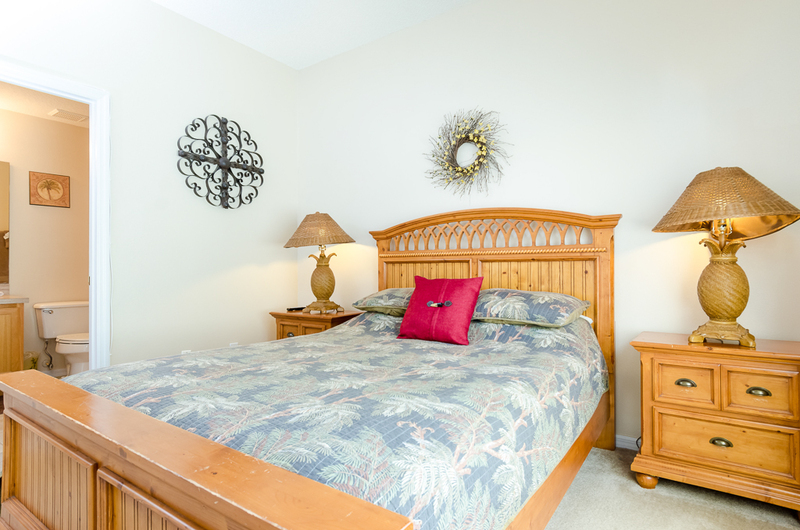 The second master suite (also with its own private bathroom) is located near the front of the home, with the two guest rooms between the master suites. Location and privacy sets this vacation home apart from the rest. 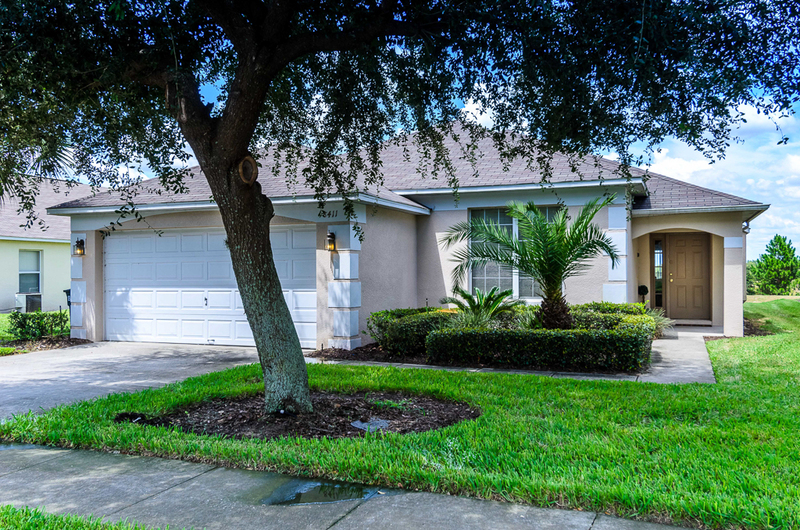 Backing up to a pond/conservation area and located towards the front of Emerald Island, the clubhouse and gated entrance are close by (walking distance). 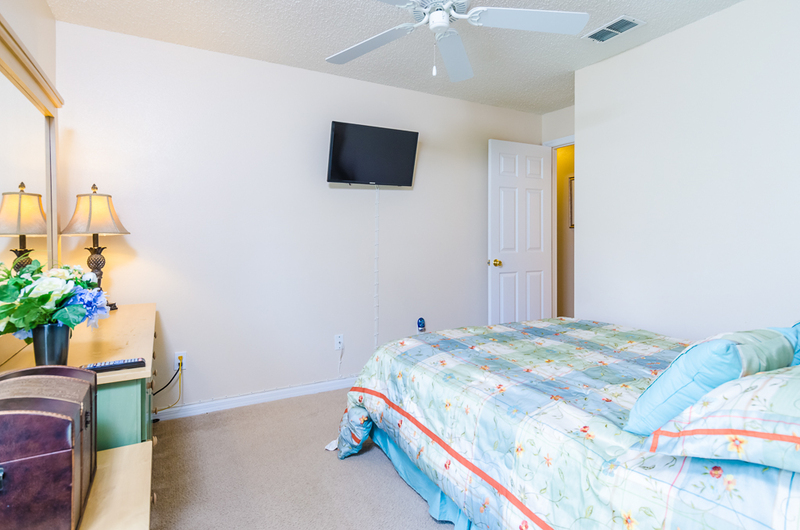 Upgrades include new carpet, newly painted interior, a bay window, double master suites, a heated pool/spa (including a child safety fence) and a two car garage with game table. 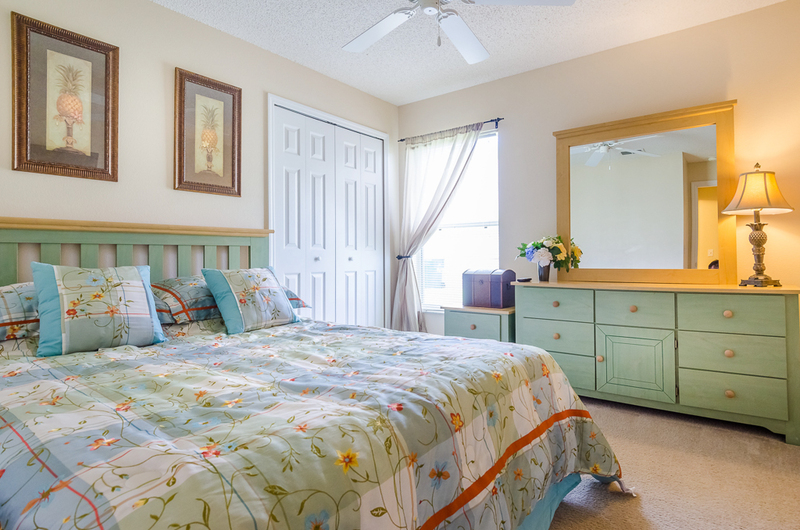 This 4 bedroom, 3 bath vacation home is an excellent value and has sleeping accommodations for eight people with the four bedrooms. 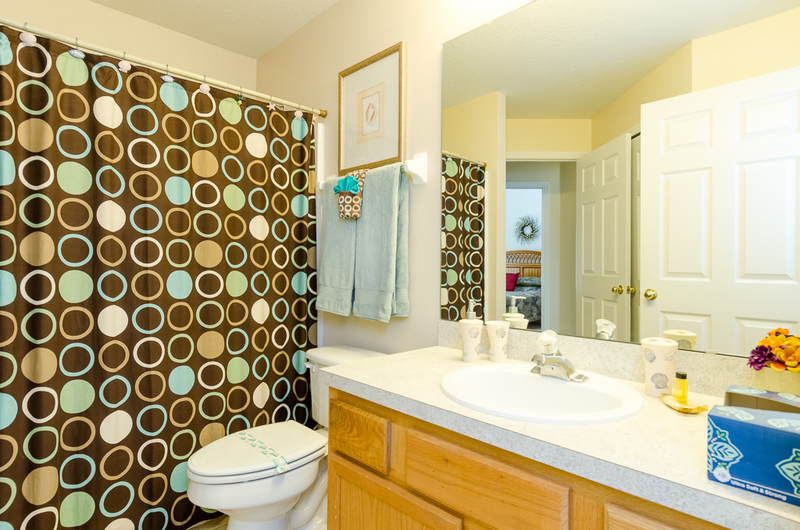 CLICK LINK BELOW TO VIEW THE VIRTUAL TOUR!!! A MUST SEE! 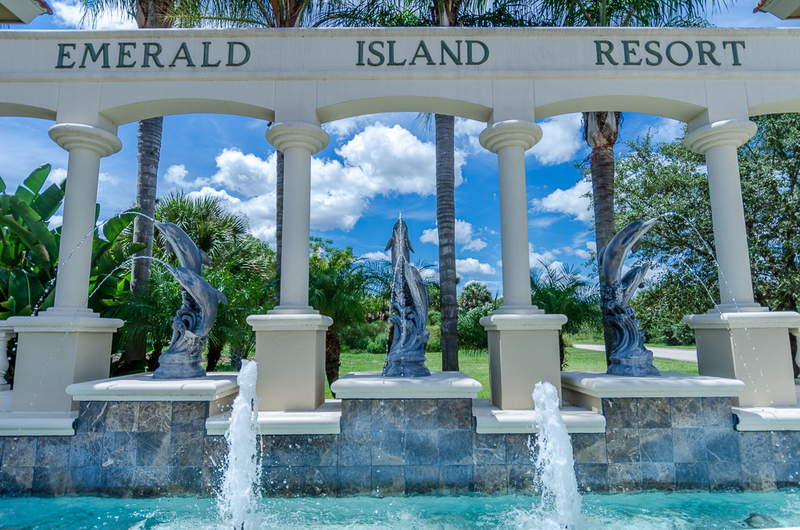 The Emerald Island Resort is manned and secured 24 hours a day has many community amenities. 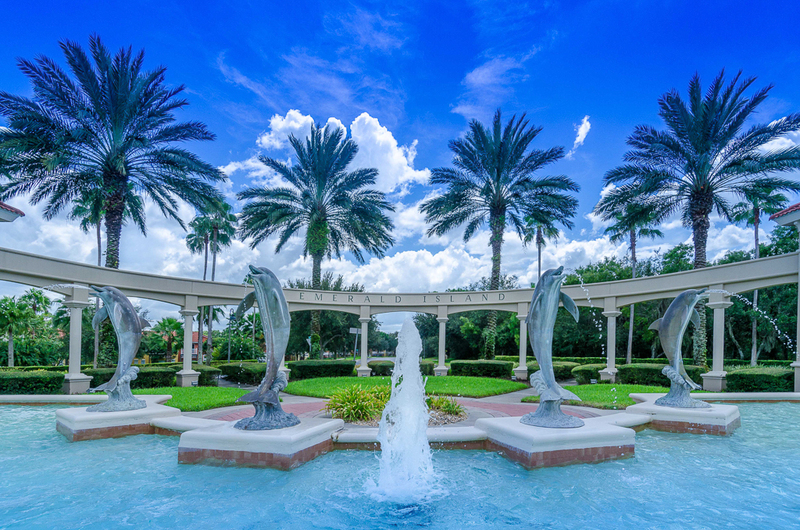 The entrance has the appearance of a five star resort with many large porpoise/dolphin statues and water fountains! 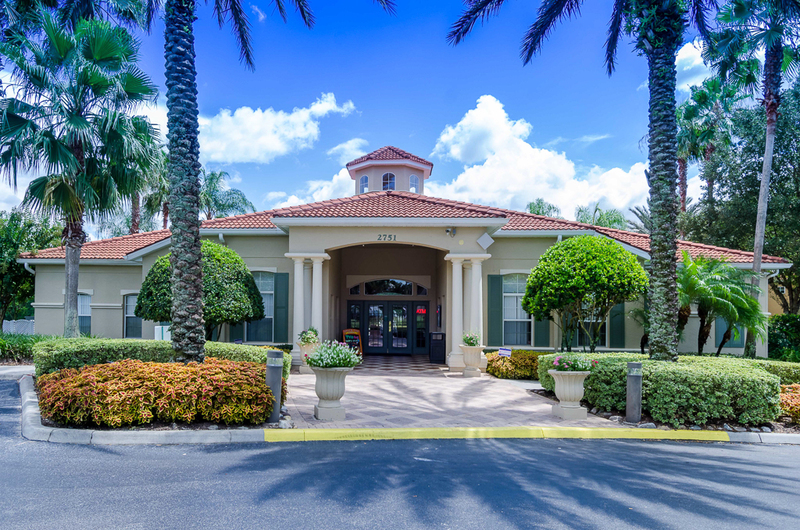 The clubhouse has a gym facility, cyber café, game room, WIFI access, and concierge service. 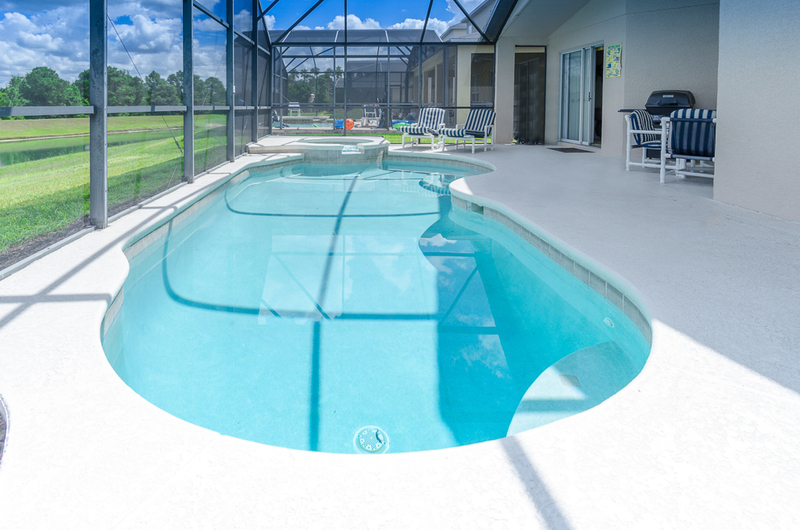 Just outside the clubhouse is a pool area with spa and cabana, sand volleyball court, barbeque picnic area, and a tot lot overlooking an expansive lawn and conservation area. 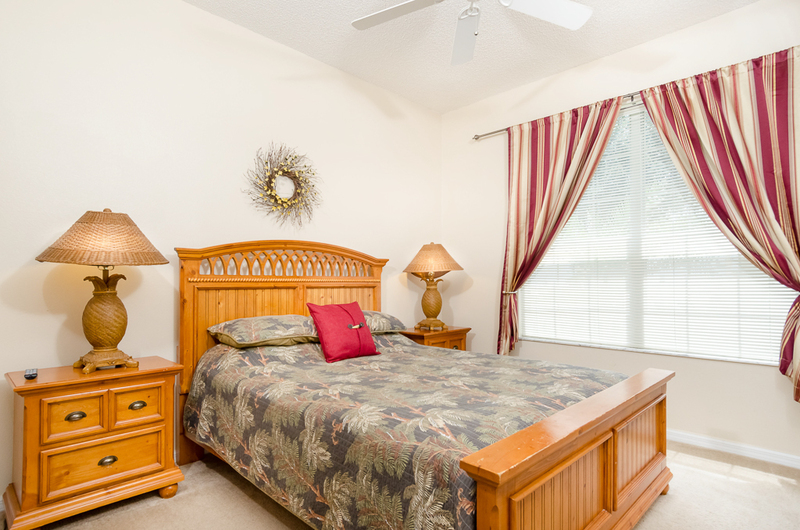 Nearby are ponds with water fountains, hiking paths/nature trails, tennis and basketball. 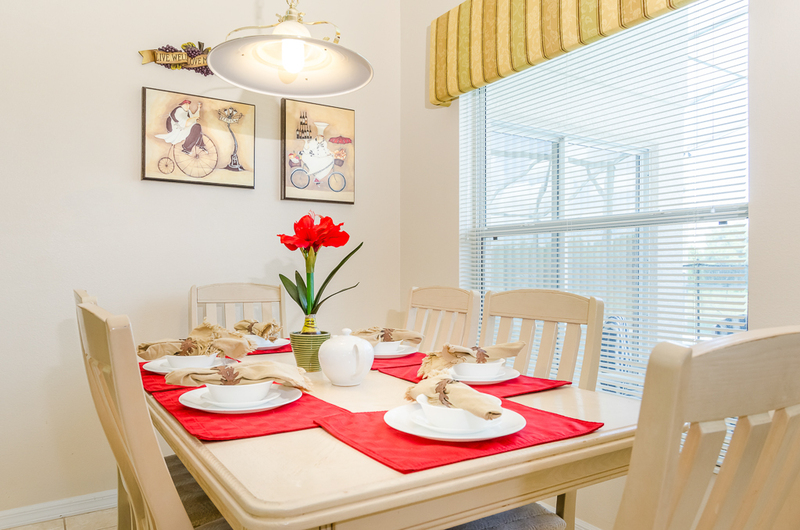 The community is centrally located (about 3 miles to Disney) and minutes from popular US192, shopping, dining, and attractions. A shuttle service to the area’s attractions is available to guests for a nominal fee. Emerald Island Resort is surrounded by a Conservation Area, it encompasses over 300 acres with 11 heavily wooded acres right in the middle of the community. 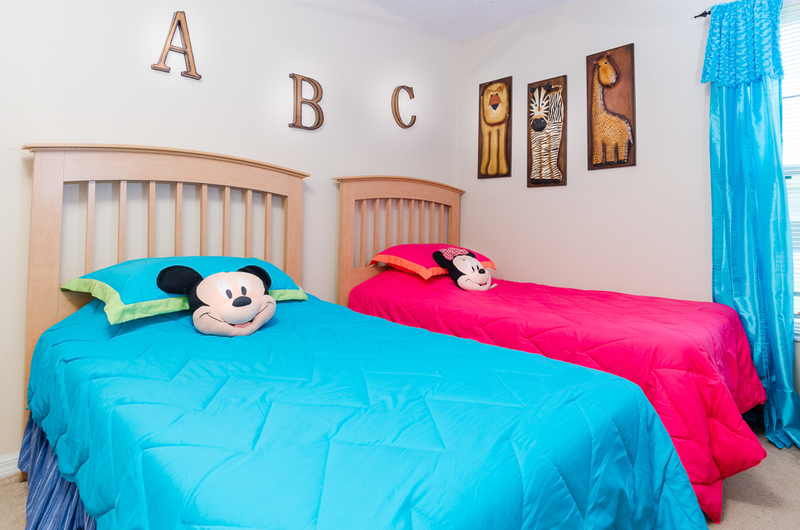 It is within minutes of Walt Disney World®, Universal Studios and SeaWorld. The airport is 20-25 minutes away. The beaches and the Kennedy Space Center are only about 45 minutes away! Busch Gardens in Tampa is only a little over an hour's drive. The place to meet our caring and attentive concierge team, headed by Superior Concierge. 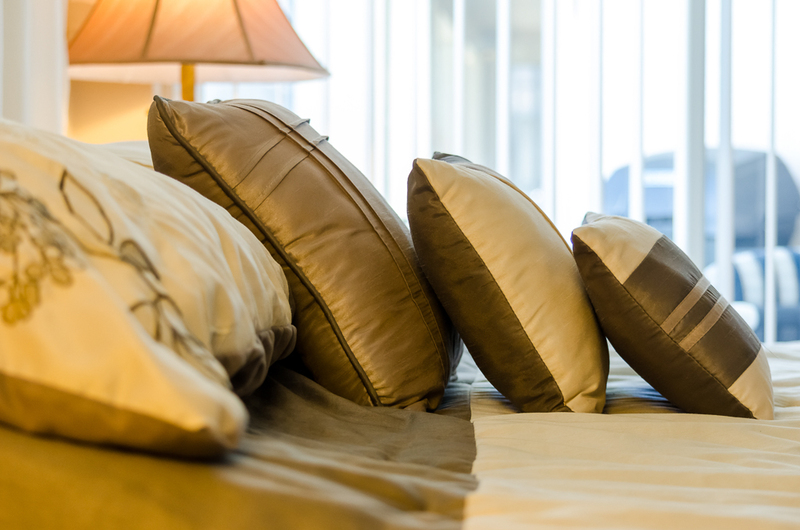 The staff are on hand to assist owners and guests with any problems or questions they may have ensuring that their stay at Emerald Island Resort is a happy and memorable one. After registering your vehicle and obtaining your parking permit, enjoy a cup of tea or coffee while you plan your park days. The staff can assist with dinner show and restaurant reservations as well as discounted tickets for the major theme parks. Don't forget to ask for current deals on local golf courses. Tiki Bar with snacks and sodas. All children must be accompanied by a responsible adult. Cold Beer and wine available from the licensed Tiki bar. A selection of hot and cold snacks. Cold Sodas from the soda fountain and popsicles for the kids. The place to work on those Abs, Pecs and Quads. Build up your stamina before venturing into the theme parks. You're going to need it. Electronic games arcade style. Games require tokens that can be obtained from the change machine in the room. Meet those new found friends and discuss plans for the day or enjoy a complimentary cup of tea or coffee. Want to watch the game on a big screen? Then this is the place. Bring your laptop and surf the net via the open WiFi service available here. 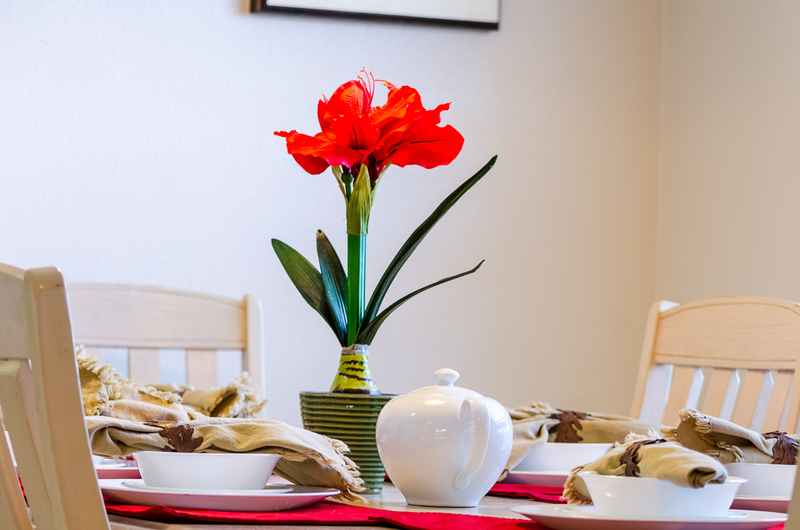 On weekends enjoy a complimentary Continental breakfast or a bagel. Hey how about a donut and coffee? Can't tear yourself away from the information superhighway? Then get along to the clubhouse and surf the net, pick up those important emails and generally reflect on what you are doing on a computer when you could be out soaking up those rays or enjoying Emerald Island and Florida and all they have to offer. 11 acres of natural woodland with a concrete pavement winding through it. A place of solitude and quiet, a place to reflect on the wonders of nature, away from the general bustle of today's busy lifestyle. For those budding MacEnroes and Nastasi's, here is the place to enjoy a game of tennis. Two full size floodlit courts await you. 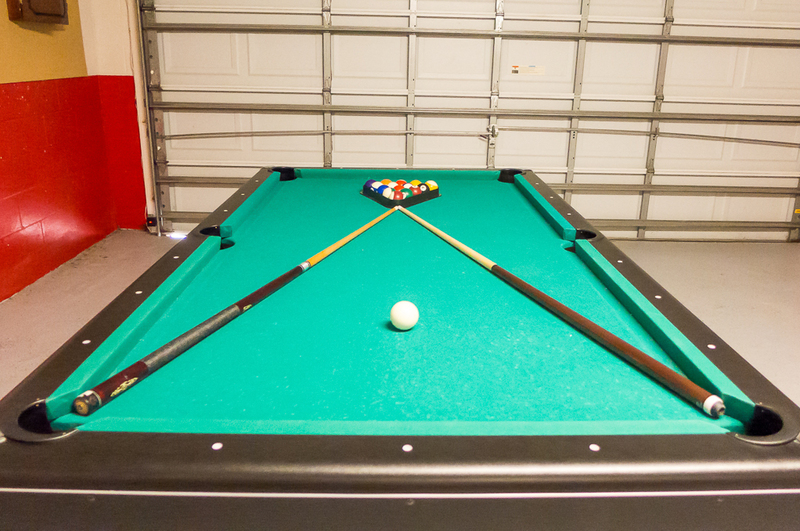 Equipment is available for hire at the clubhouse, for a small charge. Who knows next time it could be Flushing Meadows or the Stella Artois or even Wimbledon! Climb, swing and play to their heart's content. 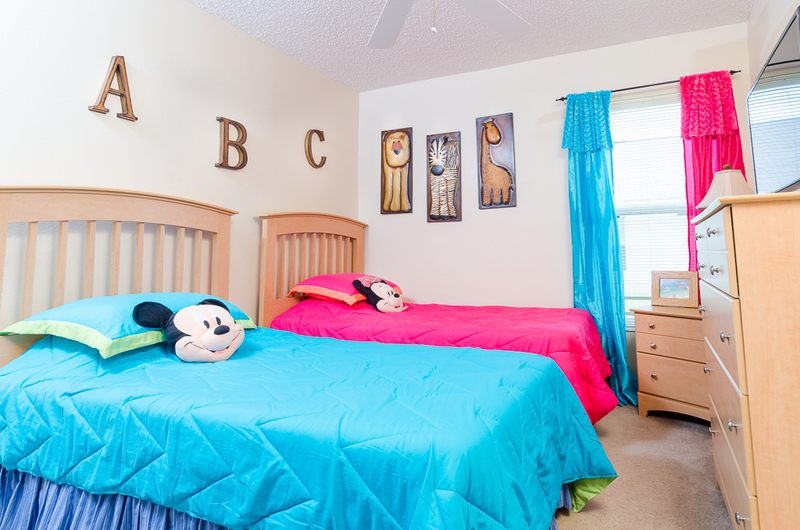 This tot lot area is ideal for those kids and families based at the West side of the community. Give the toddlers a treat and those that didn't reach the height restrictions in the parks. Not quite the Hulk or Dueling Dragons, but with a child's imagination these items can be anything they want. The home was nicely decorated; plenty of room for a group of 6-8. It appeared as advertised! Even the minor corrections were addressed promptly - I definitely would recommend this location as all local shops, stores, and parks are no further than 15 minutes away...we enjoyed our stay! Thank you for your great review. Please recommend us to friends and family. Hope to see you again. This property was just as described. Very clean. Well maintained. Very nicely decorated, felt right at home. No problems during our stay at all. Clubhouse is very close which is a bonus. We would definitely stay here again. Having been to Orlando many times and stayed in many villa's this one is up there beside the best. 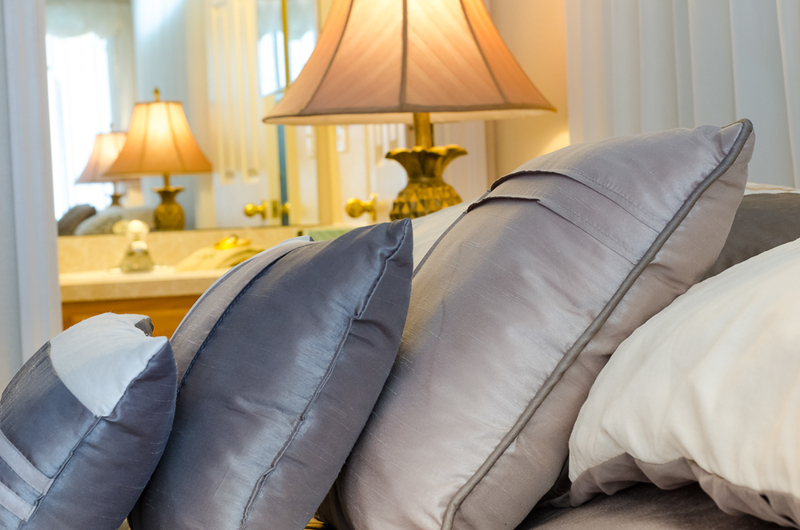 The villa has everything you need, just as it looks on web page, extremely comfortable beds ! !, and very clean. The peaceful lake view from the pool was wonderful. Emerald Island is one of the best locations to stay in. A few hiccups which is quite normal was swiftly dealt with by a very attentive management team, prompt replies to our needs. I would recommend staying in this villa and would definitely stay here again. We had also asked the villa owner a huge favour which they were very accommodating with. 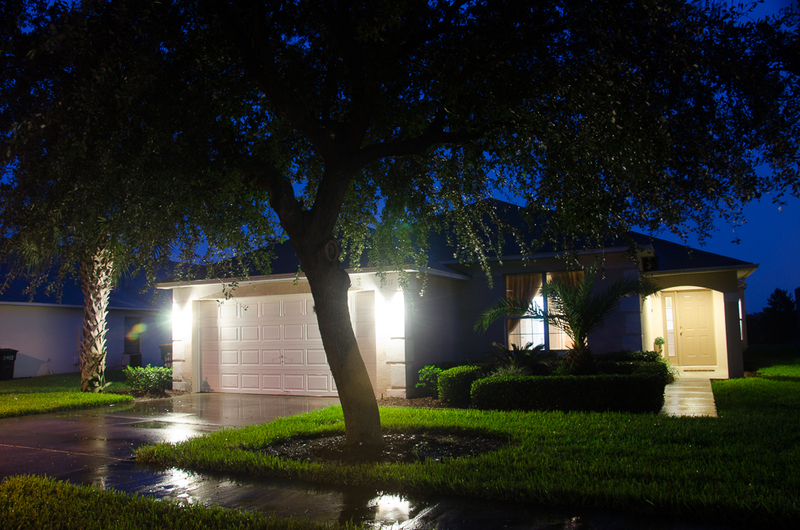 House is in good location and area is peaceful. 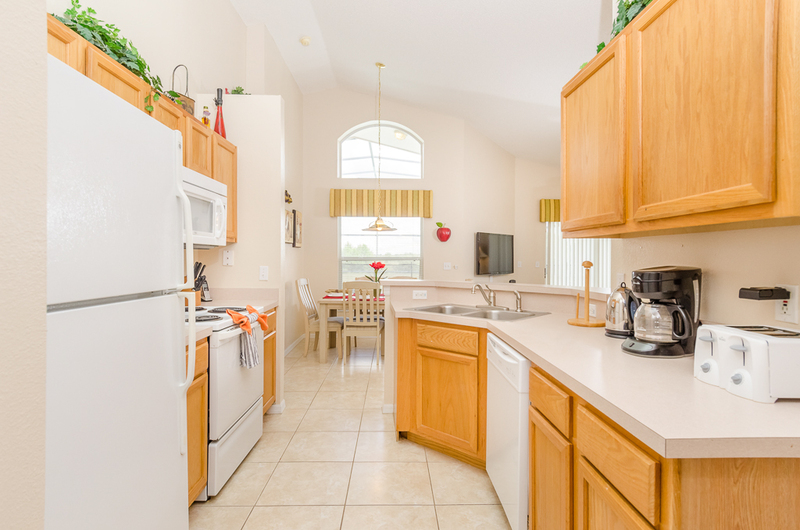 House has all the basic conveniences that you need, but no extras. We had the pool heating as extra cost and it was worth it, specially during winter months. Pool heating worked perfectly and water was always very warm. There is also nice view from the lanai to waterfront and all its birdlife. The house needs quite a bit of TLC and is worn out, but if you can look pass the surfice you'll be good. Owner of the could mayby think some updating and fixing new furnitures, then the daily rate would be more understandable. We had a nice stay here anyway. Great location, great view, villa a little tired, in need of some updates. Great location, nice peaceful, lakeside view. Villa was a little tired needed an update on towels,shower screens, bed linen, bedroom carpets, furniture and kitchen cabinets. Disappointing spa pool heating not very warm! Stayed in other villas where the pool heat has been much warmer. Ok for the two of us not sure if I would book for a larger family not enough outside space. Housekeeping needs improving very dusty.